Live practise of kata is a must! A widespread misunderstanding around kata is that it is an alternative to live practise. Not so! The truth is that kata is there to support and inform live practise! As Gichin Funakoshi said in Karate-do Kyohan, “Sparring does not exist apart from the kata, but for the practice of the kata." The past masters were very clear on the unbreakable kata/kumite link. As another example, Choki Motobu wrote, “Kumite [sparring] is an actual fight using many basic styles of kata to grapple with the opponent”. Sadly, things are different today. The link between kumite and kata has been severed with kumite being based – not on the methods recorded within the kata, or the needs of self-protection – but on the rules of modern competitive formats. To fully realise the value of kata we need to learn the lessons they are intended to encapsulate i.e. the right mindset, breathing, posture, movement, tactics, strikes, grips, chokes, locks, throws, cranks, strangles, trapping, unbalancing, etc, etc. As part of the “karate process”, our study MUST include the live practise and pressure testing of these methods against a resisting partner(s) in sparring. Kata are the “recipes” of karate. They tell us how to “cook”. But reading and reciting the recipes does not make one a chef! For that, we need to get into the heat of the kitchen and follow the recipes. Learning and reciting the solo form of the kata does not make you a martial artist. You need to take the lessons of the kata and practise them in live drills. When you do that, then you are then a martial artist. A trainee chef needs recipes to learn from. They won’t be making good quality food if they just waltz into the kitchen and start randomly, blending, frying and boiling things. They need a structure to their study. Kata, when correctly understood, provides that same structure for the karateka. There are some who argue that, in this modern age, there are better ways to record information i.e. videos, books, etc. and hence kata has been superseded by technology. I disagree. Karate is a physical activity. It therefore makes most sense to record the lessons in a physical medium. 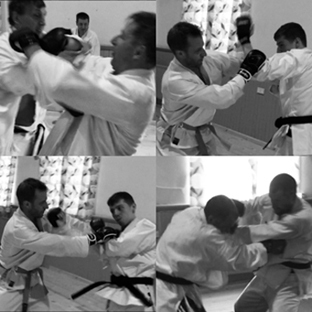 Kata practise – when done right – will provide physical conditioning and help improve technique; as well as further strengthening the combative habits gained though other forms of training. Watching a video won’t do that. Neither will reading a book. There are also some lessons that need to be “felt”. Kata can record those “internal feelings”. External media cannot. Kata – with the right understanding, intent, visualisation and mindset – is an extremely effective way to record and communicate combative information. It is also a great form of supplementary solo training. What it does not do is remove the vital need for live practise; it was never supposed to! Kata and Kumite should not be separated. They need each other. They inform each other. Yesterday, we spent some time in the dojo looking at the limb-control methods found within the Pinan (Heian) kata. We also looked at how the hiki-te (“pulling hand”) in those kata can control the enemy, create openings, and monitor the enemy’s actions. We did the solo form, and we did the bunkai drills with a partner. We then donned the gloves and let those methods have free rein in sparring (see picture). The karate / kata process is incomplete without live practise. It is a non-negational must-have! Kata is like ice. When “cold” it remains the same. You add the heat of combat, and it becomes fluid and infinitely adaptable. Just like water and ice, kata and kumite are also the same thing in different states. Kenwa Mabuni wrote “If one sufficiently and regularly practices kata correctly, it will serve as a foundation for performing – when a crucial time comes – any of the innumerable variations.” This is the “ice” of the kata becoming the “water” of kumite. Kumite, based on the methods encapsulated by kata, needs to be part of the practise of all karateka. You can learn more about the kata-kumite link in the videos below.